Hey Style Lovers, happy Wednesday! With fall right around the corner, I see the need to create outfits that will transition from summer to fall seamlessly. 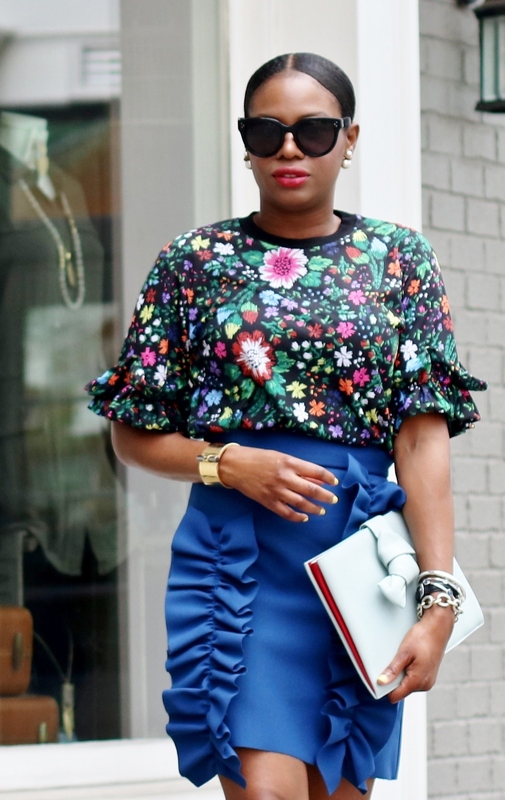 Today’s midweek style inspiration highlights the ruffle, and floral print trends. Both styles have been major this summer and will be just as popular during the fall. I love discovering unique pieces such as this skirt. The ruffle details make the skirt the ultimate statement piece. The deep hue of the skirt makes the color perfect for fall and vibrant enough for the summer. I utterly love the floral print, and the ruffle sleeve detail of the top, it is completely feminine and ultra chic! Matched with the skirt, the combination of the top, and skirt create a visual masterpiece. I completed the look with cool colorful accessories, creating the perfect display of colors fit for both summer and fall.